PESACH IS COMING SOON! PLEASE RSVP ASAP! The annual Aitz Chaim community Seder will be held Tuesday evening, April 11, at The O’Haire Motor Inn, 17 7th Street South at 5:30pm. That is in just 2 short weeks! Please get your reservations in ASAP! We need to get the count to the caterer by April 6. The meal will include all the traditional fixings and a multi course dinner including matzo ball soup, salad, brisket, chicken, potato, vegetable, and dessert. Cost will be $28 per member adult, $38 per non-member adult. Children under 13 are half price. A vegetarian main course can be made available upon advance request. The Seder will be led (by popular demand) by Aaron Weissman. Payment is preferred in advance unless other arrangements have been made. Please be aware you will be responsible for the cost if you do not attend and have not canceled prior to April 6. This weekend marks the end of the Passover holiday and the return to eating chametz. During the last week, we were to think about the meaning of freedom and when we lacked both national freedom and also personal freedom. 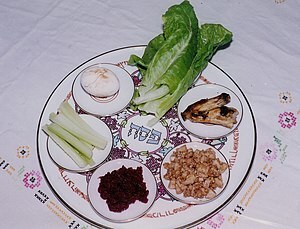 One of this holiday’s aspects that makes Passover so unique is that it is a time when we are “chametz-free”. The term chametz is not easy to translate. We often translate it as “leavening”, or something that makes food rise. Thus, Jews around the world refrain from eating most bread products and beers throughout the holiday. Can we see Passover as the first “gluten-free holiday”? In reality, as almost every Jewish person knows, translating the word chametz for someone outside of Jewish culture is not easy. The word conveys a sense of “puffed-up” and of “self-importance”. Thus, it has both a food-science meaning and a spiritual and national meaning. Chametz reminds us that we are free but only within the confines of society. The term also reminds us that each of us is just one small dot in the scheme of history, that to rid oneself of self-importance is another way to rid oneself of perpetual slavery. And again in chapter 6 of Leviticus we read: “… its remainder (of the meal offering) shall be eaten by Aaron and his sons; it shall be eaten as unleavened cake (matzot) in the sacred precinct … It shall not be baked with leaven …” (6:9-10). Does being chametz-free here symbolize the unfinished, the work that has yet to be done to complete a task? As we finish the holiday of Passover we remember that the search for freedom and human dignity is also an unfinished business. To be chametz free then represents the beginning of a yet-unfulfilled process. Now that we are about to end the Passover holidays and enter the comforts of the chametz world, it is our responsibility to remember that our journey to collective and personal freedom is not yet complete, that all too many of us have become spoiled and at times selfish. How do each of us remember the lessons of Passover and the meaning of freedom throughout the rest of the year? What do you think? Our community Passover seder is coming up in about three weeks! The seder will be held on Friday, April 10, 2015, at 5:30 P.M. at the meeting room at Clark and Lewie’s restaurant, 7th Street and 1st Avenue South. Please RSVP as soon as possible! You can make your reservation on our website by visiting https://aitzchaim.com/pesach-seder-reservations/, by sending Laura Weiss an email at president@aitzchaim.com or by calling her at 452-8621. Our Aitz Chaim Community Passover Seder 5774 (2014) was another rousing success. The number of participants surpassed expectations. As always, there were a few memorable impromptu moments, such as the asking of the Four Questions and the search for the Afikomen. A special thank you to our Seder leader Aaron Weissman, who did a masterful job of guiding us through the Haggadah and the songs. Aaron has led the Seder for several years now. In order to fulfill the mitzvoth of passing on our heritage to the next generation, he says that next year there will be a few younger helpers who will volunteer (or be voluntold) to lead the Seder. Next year, if not in Jerusalem, we plan to be again at Clark and Lewie’s. Our sincere thanks for their hospitality and expertise at preparing this symbolic meal, especially with the head count rising almost to the very hour of the Seder. After several years, they are really getting the hang of it. Click the link below for what you may have missed, or for a reminder of the joy we shared as a community on this special night, which is different from all other nights. “What would you say if I sang out a tune, would you stand up and walk out on me? And he does. Thank you, Aaron, and all the friends, old and new, who participated in our Community Seder. Shall we take it on the road?